6. What are the different factors involved in wind loads and snow loads? Most aluminum awnings are engineered in accordance with the International Conference of Building Officials. If that is the case they will have an I.C.B.O. research report number. The primary factors in that report are about using the right gauge material, the proper tributary spans, the proper size footings for anchoring and the proper distance between columns. The report rates the awnings according to live load per square foot, snow load and wind speed. Some awnings are rated for a 10lb. live load and 70mph wind speed, while some may be rated at 30lb.live/snow load and 100mph wind speed. The major differences between the two are the panel thickness, the type of posts used, the distance between posts and the way the posts are anchored. In many cases an awning will go from a 10lb. 70mph rating to a 20lb. 80mph rating with only the addition of an extra post or two. Any awning salesman or awning company should have these reports and be able to help you attain any desired rating you need for your weather conditions or city codes. If you are attempting to get a permit for an awning you are building you will probably need a copy of the I.C.B.O. report. 7. What can I mount to the sides of my awning for extra shade? 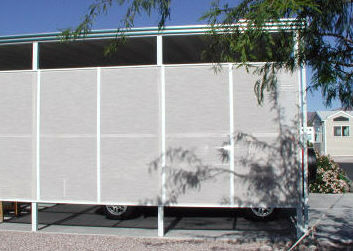 Shade screens work well mounted to the posts of your awning. Aluminum tubing can be used between the posts at the top and bottom of the screens and the frames can be mounted to the tubes. Flex pan window awning material adapts nicely to the sides of awnings. The window awning flex pans can be mounted flat against the awning posts or at an angle as if it were over a window. Boxed ends are nice additions to awnings. The same material that is used for mobile home skirting can be used to add extra shade to awnings. 8. Does my awning have to attach to an existing structure? Aluminum awnings can be built either attached or freestanding. The posts on a freestanding awning need to be made from heavy gauge steel and be concreted in the ground at least 2'. Some companies make a thick 12' square steel mounting bracket to allow posts to be placed on top of a concrete slab. If a permit is required make sure your awning has the proper engineering. The I.C.B.O. report will tell you all the ways a particular awning can be properly anchored and still meet code requirements. 9. Can I attach one awning to another one? There are two ways to attach one awning to another. First is the awning extension, used to extend the width of the awning. If the new portion of awning is the same type material as the existing awning you would remove the side fascia, install the new gutter using a gutter splice and lock the new paneling into the existing. If the new material does not match the old you cannot splice the gutters together properly and the pans will not lock together properly. In this case you attach the new side fascia to the existing one, seal the connected area, and continue building the new awning as a separate unit. The second way of attaching awnings is called the piggyback. If you want to change the projection of an awning from 10' to 20' a new awning can be piggybacked to the existing one. 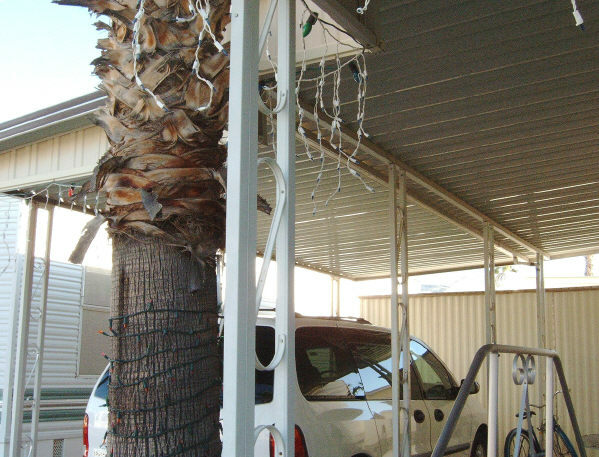 The hanger of the new awning must be firmly attached to the gutter of the existing awning. As the panels are being installed short 3' pieces of flashing can also be used to cover over the space between awnings. This flashing should be screwed into every panel lock of both the old and new awning. Since there is no engineering for this type of attachment if a permit is required you would need to dismantle the awning and replace the panels with ones of the desired length. 10. If my concrete pad is off level will my awning be off level? No, not if you cut your posts to fit your slab. When attaching the hanger to the home make sure it is perfectly level. At the front of the awning decide how much slope you want the awning to have and the proper length of the first post. From there you would measure the slope of the concrete and adjust the length of all the rest of the posts. I use a laser level to find the exact slope of the concrete so my post lengths will always match the concrete. Another way to do the same thing is to set the gutter up on saw horses in the exact location it needs to be, next use shims and a carpenters level to make the gutter level on the horses. Now measure down from the gutter to the concrete at every post location. Those measurements will tell you how to cut your posts to fit. We would love to try and answer any other questions you may have. You can always reach me here. In the Mesa Arizona area give me a call for a free awning estimate.